Word of the Year 2018 – write. play. repeat. Looking out at the snow from my writing desk, it seemed like a great time to finally get around to my Word of the Year post. Since 2009, I’ve been selecting a word to guide me through the year rather than doing traditional resolutions. My word acts as a sort of spiritual nucleus for the year, and often ends up influencing me in interesting ways that I’m not always actively conscious of in the moment. My word usually comes to me at the end of December, but I like to sit with it for awhile to be sure it feels right before posting about it. 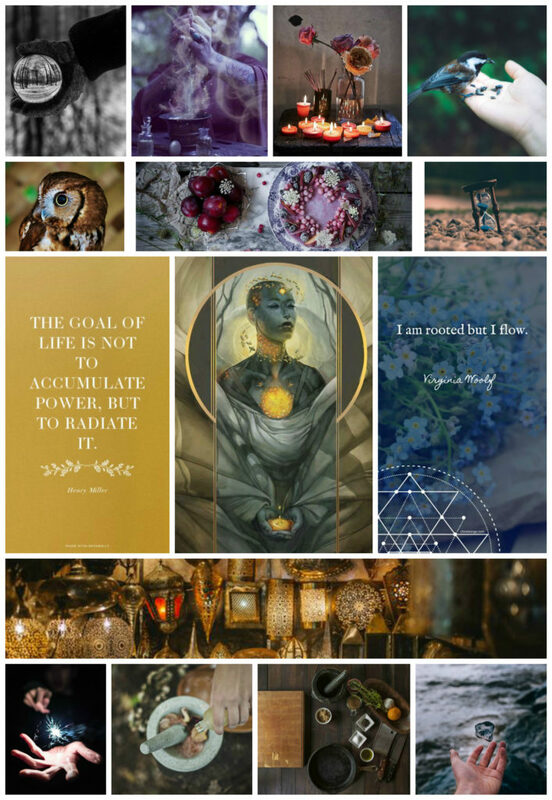 Last year, I also made an inspiration board to go with my theme, which I set as my desktop background. I loved seeing it every day as I worked and reminding myself of the “vibe” I wanted to create. That trick worked so well last year that this year, I had my board printed to hang in my office, made a notebook with it as the cover, pasted it into the front page of my Passion Planner, AND set it as my desktop background. It would take me serious effort to ignore it! this year’s theme is EMBODY. I once again participated in the Stratejoy Holiday Council program (which has become an annual gift to myself.) In Holiday Council, Molly helps us figure out a theme for the year and also a few chosen Ways of Being, or ways of approaching daily life that support the main theme. This practice has been a great way to expand my annual tradition and has helped make goal-setting more focused and meaningful. Acting rather than reacting; staying centered; being rooted in my home; practicing mindfulness and focus. Sending out light; using my voice to guide and help; leading with care; laughing more; being fully present. Being discerning, especially with my time and energy; Acknowledging my experience; Using good judgement in personal & professional relationships. Fully committing to my work; showing up every day; expanding my skills; being consistent. Taking joy in simple things; creating space for play; enjoying the fruits of labor before jumping directly to the next thing. Do any of you choose a word for the year? Or do you have another way of approaching goals and resolutions? I’d love to hear about it.